PowerInbox, the email platform company that makes messages interactive, has just crossed 1 million email views. The startup has expanded from its initial, limited set of third-party services supported (Facebook, Twitter, Groupon, etc. ), and can now run over 50 “email apps” in your inbox. These apps allow for interactive content from sites and services that range from Spotify to Hulu to Pinterest, and even to those you might not expect, like The White House and MSNBC, for example. According to founder Matt Thazhmon, the company has fielded over 200 app requests from users to date, and has been busy beefing up its lineup in recent weeks. Some of the more notable new additions include Wikipedia, Vimeo, Ustream, Tumblr, The Onion, Scribd, Spotify, Slideshare, Pinterest, MetaCafe, Kickstarter, Justin.tv, Grooveshark, Hulu, ABC News, Foursquare, Flickr, ESPN, College Humor, CNN and Amazon, to name a few. If you’re not familiar with the startup, what PowerInbox does is offer a way for users to interact with their favorite web services from within their email messages. For example, you can like, reply, comment or tweet from emails coming from Facebook and Twitter without having to open another window and visit the website. Thazhmon says that Twitter is the most popular of all the supported apps, with 30% of PowerInbox users tweeting from their email. The company also offers business-friendly features that allow marketers to customize emails with interactive features of their own, or build messages that also include “apps” like their brand’s Twitter feed or Facebook wall. Another cute new addition rolling out today is something called “PowerInbox icons” which, sort of like Gmail’s superstars, highlight messages from various services using a visual indicator. Retailers can send emails with an icon of a purse for a sale on handbags, or a shoe icon for a sale on shoes, for example. Amazon messages have Amazon’s “a” logo, Pinterest, the red “p,” and so on. Users can then quickly scan their inbox to see which emails they want to open. Early reports indicate that this has led to increased open rates, says Thazhmon, which now hover around 26%. 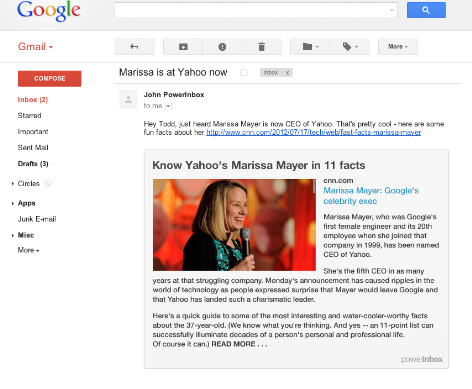 Another PowerInbox integration launching now has just outed a new email startup. Philterit (beta) is building a visual inbox that includes a dashboard and system for separating personal emails from brand messages. 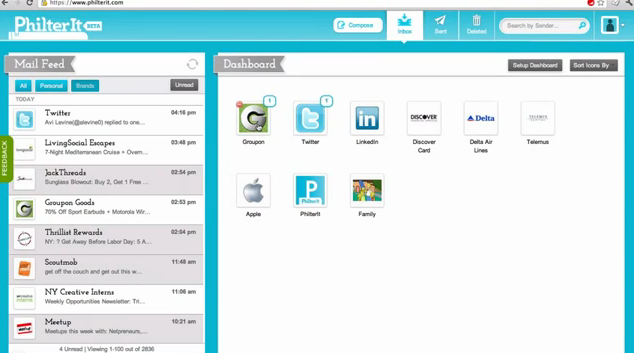 The platform is also designed to work on mobile and tablets. (More on this later!). Along with the 1 million email views, Thazhmon says that PowerInbox is now seeing daily engagement of over 80%, support for 8 email clients (including 4 directly integrating with the service), and is planning to begin its Series A discussions in August.